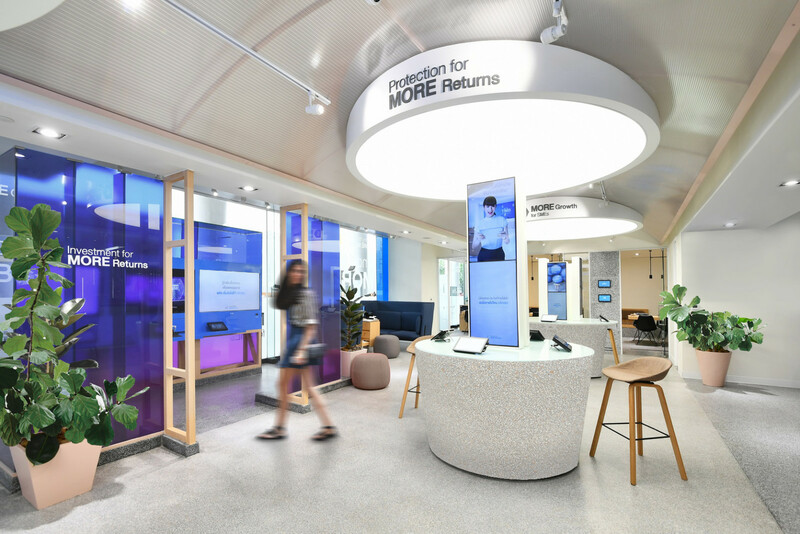 A new customer experience and a branch design project to define an innovative way of banking, becoming an international benchmark, to live the branch in an omnichannel way by connecting both physical and digital touchpoints. 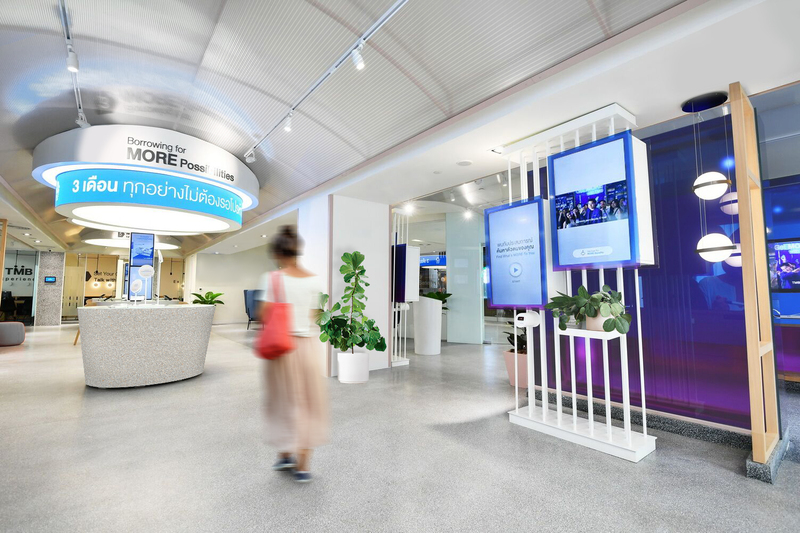 TMB Bank, Thai bank based in Bangkok, unveils the “TMB Experience” as a digital retail banking project embraced by a high-tech Glasshouse design landscape. According to statistics by TMB Bank, 56% of Thai people leave money in a standard saving account with a low interest rate of 0 – 0.5% accumulate value of 3.92 trillion baht. In addition, the bank assumes that 48 from 100 have no saving money, 91 from 100 no investment experience and 63 from 100 have no insurance at all. We have started to conceive our design concept from these strategic results thinking to satisfy Thai consumers and enable them to manage their financial matter more effectively. Currently, TMB Experience is available in two locations in Bangkok, at the United Center on Silom and the Icon Siam. The new concept will be also applied to other two flagship branches in Bangkok and, following a KPI evaluation, on the whole TMB network. A bank with a focus on the benefits of proposed financial services through unique and complementary relevant customer experiences between digital and physical. Transaction and Advisory are always present assets, but customer needs and satisfaction to become part of TMB are the priority. THE “GET MORE” BANK wants to represent a new way to engage customers combining digitalization with human touch to enable them to enjoy the “capsule experience” discovering their real financial needs through the creation of an ‘Avatar’ identity that allows the exploration of products to reach their financial goals: an App-Based Bank or an assisted customer experience, depending on customers’ choice. 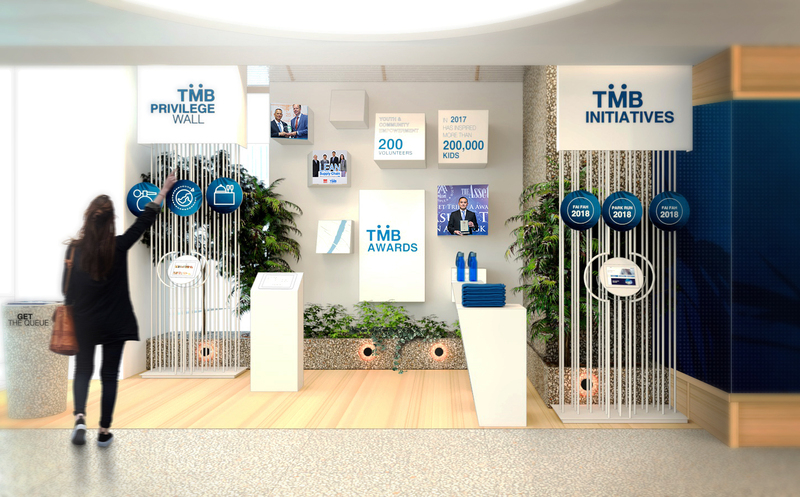 TMB Experience will completely change perception on a bank branch. “As an Italian design innovation company, we strongly believe that Retail will change its role becoming more digital but remaining the physical key-base for a lot of customers seeking the satisfaction of their needs” confirmed Mr. Marco De Carli, CEO & Founder of DINN! Leveraging on digital technologies, the newly-designed branch concept is aimed at allowing customers to get to understand their own financial needs with the assistance of both digitized tools and TMB branch personnel to help them to realize their financial needs and objectives effectively. At a TMB Experience branch, customers will engage in the play & learn digitized edutainment platform which will quickly guide them to discover and recommend the most suitable financial product category. Customers will not be forced to buy any product, but once they are ready to purchase, they will be offered the products and services on a need-based basis to ensure that they could get more benefits in accordance with TMB Get MORE proposition. DINN! 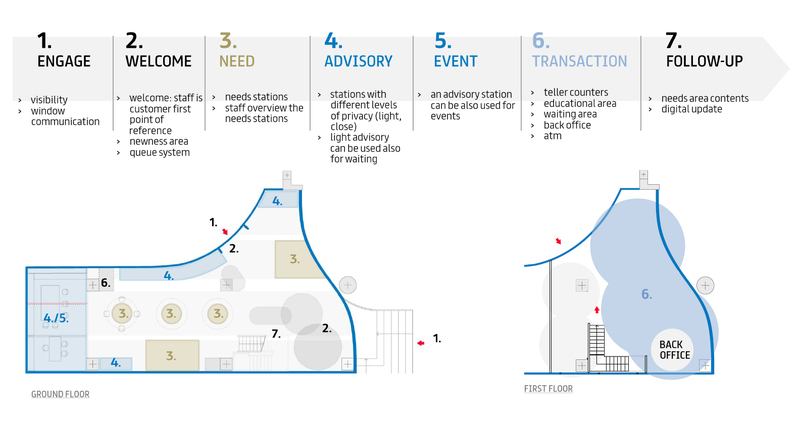 conceived a “phygital bank experience” where the branch, with its physical space, represents the enabler of real and concrete experiences that enhance the reason why become a TMB customer while the digitalization represents the enabler to simplify all banking processes. The early success was attributed to this new branch concept which derived from TMB customer-centric culture. TMB Experience will make the self-discovery process easy, convenience and enjoyable for customers while they also have time to digest the information and go for their choices of products and services. The experience that customers will get from TMB Experience are the new services that are not for sales purpose. We have created a journey, where the bank branch plays a key-role, which has been designed for customers to discover their real financial needs and explore the suitable products and services, with in-house experts available for advices. The Glasshouse Concept is a path that clearly allows clients to grow discovering TMB products, through an edutainment experience. The customer brings his needs/”seeds” while TMB reserves the right care to make it grow. In terms of design, the whole space structure takes inspiration from the Glasshouse structure made by long polycarbonate arcades on the ceiling that define all the flagship zones. Large skylights highlight different product areas, simulating the natural light of a glasshouse, while long white stems, spread into the flagship, draw different freestanding items that contain communication, taking inspiration from the plants inside a glasshouse. Small colored glassed boxes contain some product areas and separate it from the whole space, creating some more confidential zones. Starting from a Welcome and Engage Zone, customers who enter into the branch will experience the transparent and comfortable atmosphere where a multi-media panel will be installed providing useful informations to attract visitors. In this area, a visitor can engage in an “Avatar Identity” creation by answering a few questions that will represent the customer in accordance with his financial needs: a customized QR Code will be invented to be used in the Need Zone as a special key to access into a range of personalized financial products and services. The Need Zone has been designed for privacy. Customers are encouraged to use the generated QR Code to scan and take time to review a list of products and services suitable for them (the information is available in a graphic format, easy to digest). TMB staff members will be on hand to assist, explain and offer additional recommendations if needed. If customers need to discuss further on their financial planning, including mutual fund purchase or require financial advice from experts, they will be invited to the Advisory Zone: a private area where they can discuss more details face-to-face with the advisors or connect with investment or SME business experts via video calls. This zone can also be used as a dedicated space for meetings, training or seminars. TMB Experience also compliments TMB’s omni-channel strategy: once customers decide to purchase, they can subti applications directly at TMB Experience branch or drop their information using the Call Me Now service to let the personnel contact them and proceed with the realization process without having to make a physical visit to branch again. As a physical branch, TMB Experience remains offering full transactional services, such as deposit, withdrawal and payment, delivered by TMB staff in the Transaction Zone. This new concept offers the innovative opportunity to start a process at the branch and complete it online, or vice versa. For this reason, the customer can choose between being more traditional, living a physical-digital experience, or being more digital living an interactive app-based trial experience. With this new TMB Experience concept, the bank will truly Make THE Difference in the banking industry, and effectively deliver real value to the customers.